Whether or not you have a sweet tooth, added sweeteners can be downright unavoidable. And unfortunately, these added sweeteners can wreak havoc on your system. Your waistline, too. 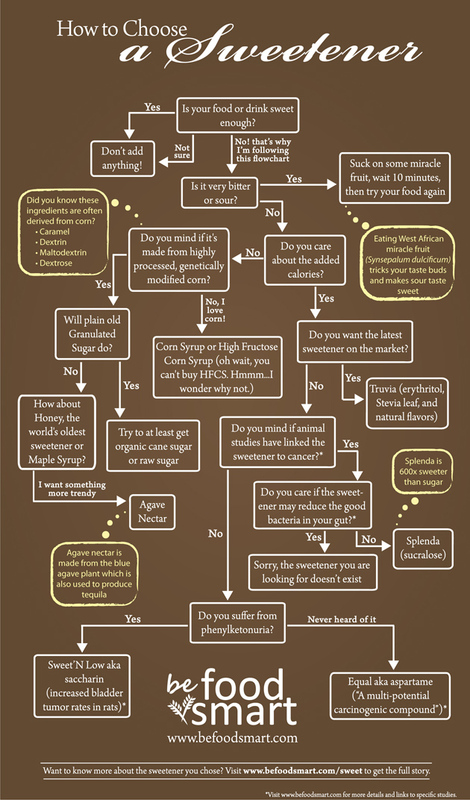 So before you actually dump that teaspoonful of Sweet 'n Low, agave or whathaveyou into your indulgence of choice—I urge you to consult the following flow chart from Be Food Smart. Funny, but a little eye-opening, too. Right? Question: To what do you add sweetness to? And what is your sweetener of choice?